GENERALLY speaking, the Munich firm of Otto had confined their attention, before the war, to the production of machines of the engine-behind type. As, however, the German military authorities, unlike our own, discouraged the construction of "pusher" biplanes, nearly all the firms who had up to then been turning out engine-behind machines, concentrated on the production of tractors. A new one of these built by the Otto firm was completed and tested shortly before hostilities broke out, and as it showed excellent capabilities both in weight-lifting, speed and carrying capacity, it would appear probable that a number of these machines are being used against us, and a few notes regarding the type should therefore be of interest. 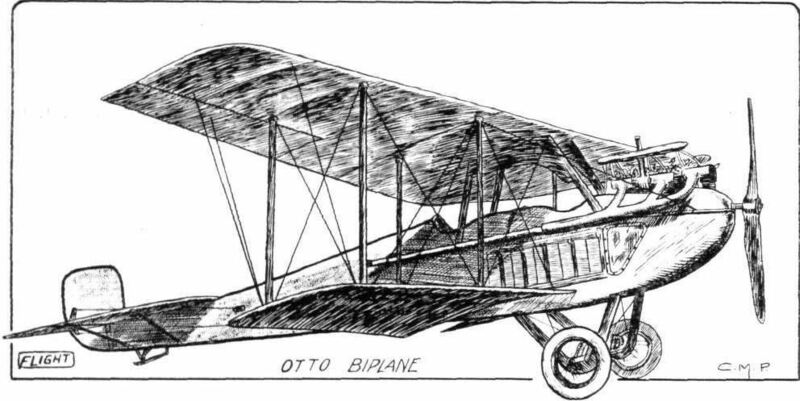 Fundamentally, the new German Otto biplane follows fairly closely on standard lines, and such improvements as have been effected are mostly to be found in a reduction of head resistance wherever possible, a reduction which has resulted in a considerably higher speed than that usually found in German aeroplanes. The body, which is of rectangular section, is topped with a turtle back in which are the openings for the pilot's and passenger's cockpits and for the engine. The rounded nose, which is covered with aluminium sheeting, provides a very good entry for the air, thus contributing considerably towards the high speed obtained, i.e. about 87 miles per hour. The engine - a 150 h.p. Rapp - is mounted on stout ash bearers in the nose of the body, and is, as will be seen from the accompanying illustration, fitted with a long exhaust pipe running back along the side of the fuselage to a point behind the pilot's seat, so as to convey the exhaust gases out of the way of the occupants. In the floor of the body, ahead of the front seat, which is occupied by the observer, an opening is provided through which an unrestricted view is obtained in a downward direction for purposes of observation or for taking photographs. In addition, mica windows are fitted on each side of the body in front of the observer's seat, so that by stooping down inside the body he can be out of the draught and still obtain a fairly good view on each side. In plan form the main planes, of which the upper one has a slight overhang, have a pronounced taper towards the tips, that is to say, the greatest chord is in the centre, the leading edge sloping backwards and the trailing edge sloping forwards. The lower planes are attached to the sides of the body, whilst the upper planes are attached to a centre section carried on a steel tube structure coming up from the upper longitudinals of the body. Small service tanks for petrol and oil are fitted in the angle between these centre struts and the centre section of the upper plane. Two pairs of steel struts on each side of the body connect the upper and lower main planes, and cross-bracing is effected by means of stout stranded cables. The drift is taken by internal cross-bracing of the wings and by cables running from the top of the first front inter-plane strut to the nose of the body. Control is by means of the usual hand lever for longitudinal and lateral control, and a pivoted foot-bar for directional control. Large sized ailerons are fitted to the trailing edge of the upper plane only. A chassis of the simple V type, usually found on modern German tractors, is fitted. It is built up of stream-lined steel tubes, cross braced with thick stranded steel cables, and carrying the tubular axle which runs right across from side to side. The tail planes consist of a semicircular stabilising plane, to which is hinged the divided elevator, and of a partly balanced rudder, hinged to the stern-post of the body. Sufficient fuel is carried for a flight of five hours' duration, which gives a radius of action of approximately 220 miles. No figures are available regarding the rate of climbing, but it is said to be exceptionally good. OF the German aeroplane constructors who have paid special attention to the development of the all-steel machine few have met with greater success than have the Otto works at Munich. In the accompanying illustrations are shown two types of fuselages which are similar as regards construction, but differ in that one is designed for a stationary engine, whilst the other is of a slightly different form in front to take a rotary motor. One feature common to all Otto machines is the employment throughout of seamless chrome nickel steel tubes for longerons and struts of the fuselage. The attachment of the struts to the longerons is by means of special steel clips, which grip the various members without piercing them, a form of construction which has the further advantage that it facilitates replacement in case of fracture. Attachment of the wings to the fuselage is by means of similar steel clips so designed that it is possible to slide the wings a short distance along the longerons so that a heavier or lighter engine may be fitted and the balance of the machine preserved by shifting the wings slightly backwards and forwards. In addition to this adjustment the angle of incidence can be altered to suit various purposes. In the machines shown both these adjustments are carried out when erecting the machine, but, according to information available, later types will be fitted with the necessary levers for carrying out this operation while in the air, an improvement that has no doubt been rendered effective by this time. Wing spars as well as interplane struts are, like the fuselage, made of steel tubes, the struts, needless to say, being of streamline section, and bracing is effected by means of stranded steel cables. The engine, in the case of the stationary motor, is mounted on stout ash bearers supported from the longerons of the fuselage; while in the machine designed for a rotary engine the bearers are more or less of a similar type to that employed on British machines. Although being made of steel throughout, the Otto biplane is said to be lighter than one of the same size made of wood, and the factor of safety in the wings is stated by the makers to be 8. A chassis of the usual simple type found in the majority of German military machines is fitted, the material used being streamline steel tubes for the struts and a tubular axle slung by rubber bands. Quickly detachable steel clips secure the chassis struts to the lower longerons of the fuselage, and the chassis can, like the wings, be moved slightly backwards and forwards to obtain perfect balance on the ground for engines of different weight. The older machines were fitted with 100 h.p. Mercedes engines, but in view of the exceptional facilities for changing over, it appears highly probable that the latest ones have engines of 150 h.p. or more, which, in conjunction with the variable angle of incidence, should give a machine of more than ordinary utility. THE OTTO AIRCRAFT WORKS AT MUNICH. - On left the works, and on right a row of Otto biplanes ready for delivery. The person in the foreground is alleged to be the chief pilot and tester, and has possibly been so placed as suggestive of the lifting power of the Otto machines. TWO VIEWS OF THE OTTO ALL-STEEL FUSELAGES. 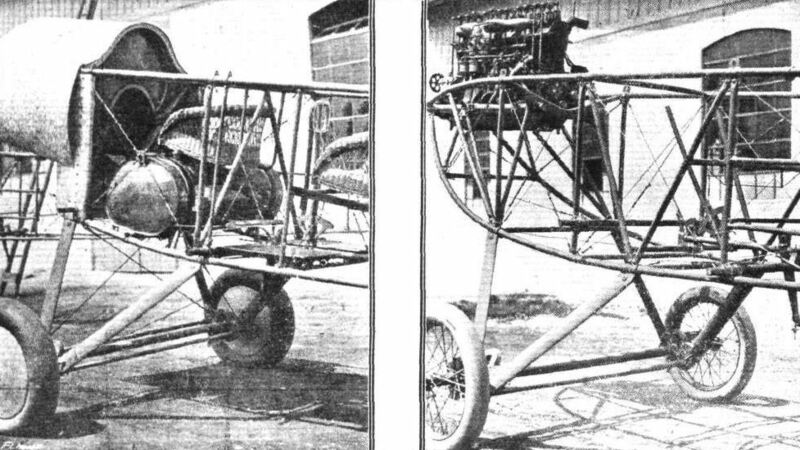 - On the right, the nose of the body and chassis of the machine fitted with a stationary engine, and on the left the nose of the biplane with a rotary motor.